In this busy summer of guests and dinner parties, I find myself reverting again and again to the simplest preparations of the summer vegetables bursting from the kitchen garden right now. Tomatoes, green beans, eggplant, peppers, fennel, first harvests of potatoes and onions can all go from garden to table with very little effort. Sliced tomatoes drizzled with a little olive oil, sprinkled with salt and maybe garnished with fresh basil fill a platter quickly, colorful cherry tomato halves mixing with slices of red and yellow heirlooms. 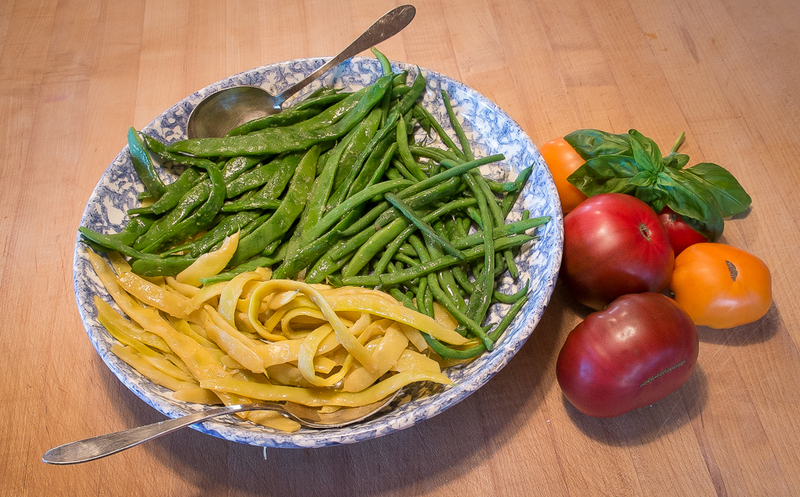 Green and yellow, skinny and wide pole beans cook in three minutes in boiling water and provide a lovely tangle of colors and textures in a shallow bowl. Eggplant quartered lengthwise, brushed with olive oil and roasted at 475 for about 20 minutes then pureed in the food processor with garlic, lemon zest and juice, ground cumin and tahini makes a lovely spread or dip, smooth flesh mixing with bits of charred skin. Chunks of potatoes and red onions, squares of red and yellow peppers and thick slices of fennel all tossed in a little olive oil, lightly salted and spread in a single layer on sheet pans roast in a 400 degree oven for 30-40 minutes. Served warm or at room temperature they make a colorful, flavorful potato salad. The pleasure in these meals starts with filling harvest baskets in the cool, early morning air and ends in the evening with friends around the sun-warmed table. Time in the kitchen is minimal, leaving the rest of the day open. Later on, when the calendar clears a bit, there will be time for more complex preparations but for now the flavors of summer nourish us with very little effort from me. Our glorious summer weather has continued into September, but the rush of summer visitors has tapered off and there’s time to think back on meals the summer kitchen garden gave guests and us at our table and at friends’ potluck gatherings. As I recall this summer’s festive meals I see the contents of our serving bowls change with the summer garden harvest. Most vividly, I remember a succession of summer vegetables in the large shallow blue and white bowl my mother gave me years ago, my favorite bowl for sharing food with a crowd. Early July brought an abundance of sugar snap peas and we piled the bowl high with pounds of quickly steamed peas for our neighbor’s annual July 4th party. A decoration of nasturtiums and white pea blossoms added red and white to the blue of the dish to celebrate the day. A few weeks later, Maxibel bush filet beans boiled whole until just tender took the peas’ place for many nights both at our table and at several island neighbors’ tables. And then pole beans, Nor’easter, Gold of Bacau and Fortex, joined the mix. Olive oil and sea salt added just before serving complemented the bean’s sweetness but the beans alone were just as delicious. For more colorful offerings, red and golden beets, sautéed beet greens and pickled beet stems composed a gorgeous salad against the blue and white of the bowl. First a layer of beet greens, then cubes of bright beets, a scattering of ruby bits of chopped stems pickled with vinegar and lots of coriander seed and finally slivers of basil leaves created a feast for eye and palate. The red, orange and yellow of summer vegetables continued with the tomato and pepper harvests. Slices and wedges of heirloom tomatoes, pink/red Brandywine, true red Dester, red/purple Cherokee Purple and Pruden’s Purple and rich yellow Golden Sunray and Kellogg’s Breakfast filled the bowl and reached the table in no time. Summer food at its best! 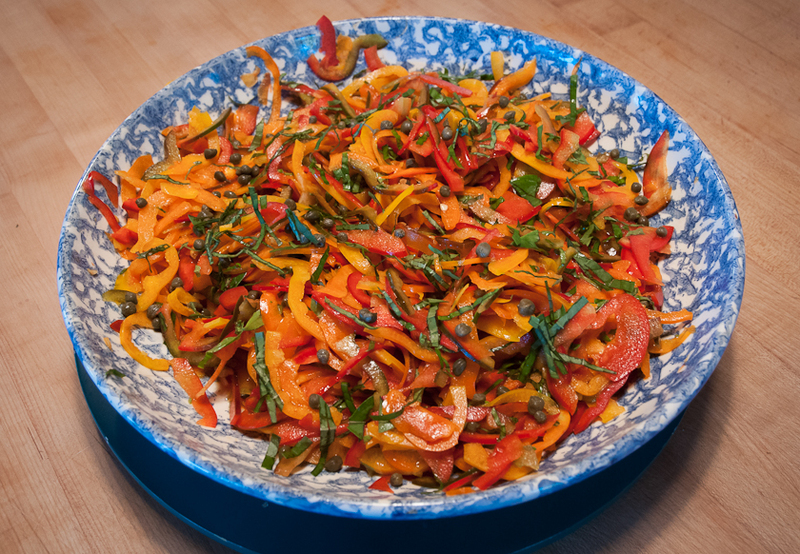 With a little more preparation time, I sliced red, orange and yellow peppers into one of my favorite summer salads, sweet with peppers and their juice, sharp from a little red wine vinaigrette and capers, colorful and crunchy. Finally ears of fresh yellow corn, picked and shucked as the water came to a boil, made it to the table in less than ten minutes. Rolled on a stick of butter, salted and devoured, corn on the cob sets the record for summer fast food. 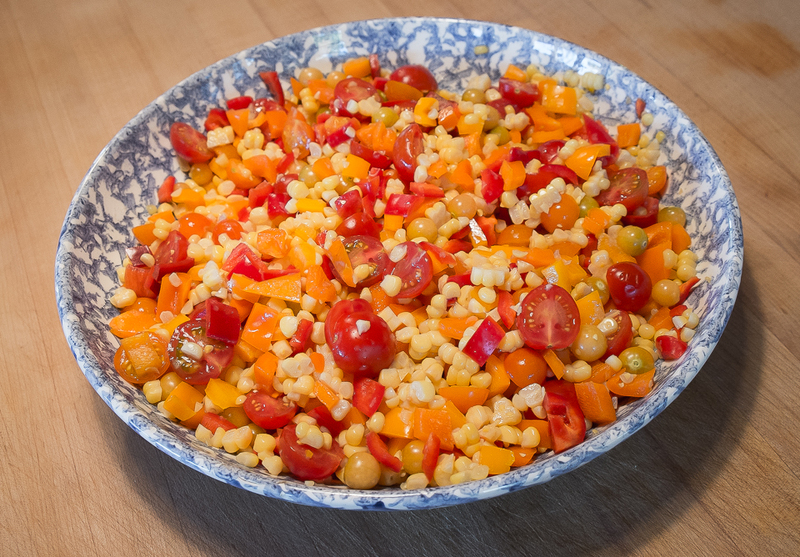 With a little more time, but not much, I cut the kernels off the cob, add them to the blue bowl along with red and orange peppers, red and orange cherry tomatoes, maybe some ground cherries, some basil or cilantro, and carry this high summer salad to the table. Summer vegetables really lend themselves to feeding a crowd quickly. That’s one of the many things I love about them and certainly the reason I grow lots of them. We are enjoying the last of the corn, tomatoes and peppers in these early weeks of September, serving them in smaller bowls often just for us or a few friends and thinking back on our most wonderful summer.